Working with Royal Holloway, University of London, Study Group has produced an established International Study Centre on the University's historic campus. We use our international marketing and recruitment expertise to attract the highest quality students from all over the world. Royal Holloway is situated on a beautiful campus location just 40 minutes from London, giving international students the benefits of out-of-town living while they study for an internationally recognised University of London degree. Study Group works with Royal Holloway, using our unique global reach to attract students from all over the world. We run the International Study Centre on behalf of the college, helping international students attain the academic, English language and study skills they need to progress to their chosen degree. 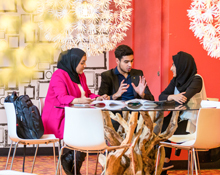 The International Study Centre staff work closely with students to choose their degree programme, advising on academic requirements, career opportunities and suitable subjects to achieve their goals. The International Study Centre also offers an English Language Preparation course for students whose English language level just falls below the entry requirement for the International Foundation Year.